This is one in a series of brief articles revisiting lessons learned in past earthquakes, and the action or lack of action in response. This series is being presented in an effort to communicate these past lessons to the newer members of our profession who were not there to experience them first hand. 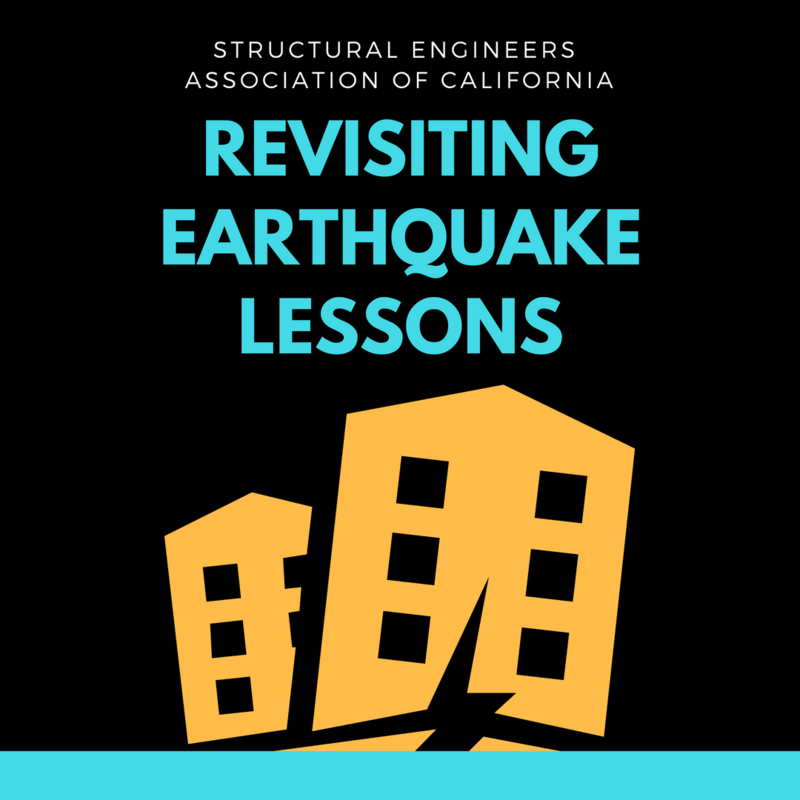 Lesson:	While historically the engineering community has given limited attention to earthquake performance of wood light-frame construction, the combined lessons of the 1989 Loma Prieta and 1994 Northridge earthquakes dramatically demonstrated that this building type can experience performance far below our historical expectations with significant impact on the resiliency of our communities. This recognition led to a new focus on understanding and improving seismic performance of this most common building type in California. Before The 1989 Loma Prieta Earthquake: The earliest building code requirements for wood light-frame dwellings codified the best practices of carpenters as prescriptive requirements, with virtually no consideration of lateral force resistance other than that provided by nominal diagonal bracing (erection bracing?) and the wall finish materials. Despite this lack of explicit seismic design, the vast majority of wood light-frame dwellings performed well in the few North American earthquakes that occurred prior to 1989. In retrospect this good performance can be attributed to their modest size, low mass, and considerable lateral strength provided by numerous “non-structural” walls. Records of damage to wood light-frame construction can be found for earlier earthquakes, including the 1906 San Francisco and 1971 San Fernando Earthquakes, but the documented shortcomings of wood light-frame dwellings were overshadowed by other more dramatic aspects of those events. 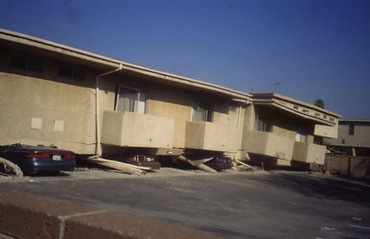 Efforts to improve construction following the San Fernando Earthquake, include ATC-4-1 recommendations for improved design and detailing of new wood dwellings (ATC, 1980) and the introduction of a Uniform Building Code requirement prohibiting conventional construction designs (i.e. prescriptive code provisions) for wood light-frame buildings of unusual (irregular) shape or size (ICBO, 1979). That being said, there was at this time an optimistic level of comfort regarding anticipated good seismic performance of wood structures. 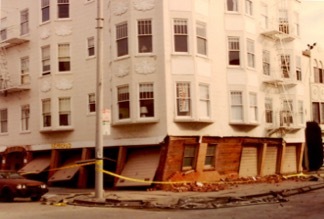 The 1989 Loma Prieta Earthquake: Of the images from the 1989 Loma Prieta Earthquake, some of the most memorable are of wood light-frame structures in the San Francisco Marina district that experienced collapse or near collapse due to weak/soft first-stories (Figure 1). 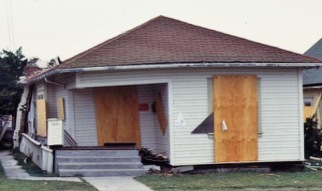 Observations of performance of this building type and other residential light-frame construction are provided in Reflections on the Loma Prieta Earthquake (SEAOC, 1991) and Practical Lessons from the Loma Prieta Earthquake (EERI, 1990). For the larger wood-light frame buildings, contributors to the poor performance were noted to include lack of bracing walls, archaic materials (many of the damaged structures were constructed between the 1890’s and 1930’s), soft-soil amplification of ground motions, liquefaction, and the particular vulnerability of torsionally irregular corner buildings. For smaller wood light-frame structures, in addition to first stories made weak and soft by ground story parking, the vulnerable behavior of cripple walls was prominent (Figure 2). Recommendations from SEAOC (1991) included considering retrofit of weak/soft first stories, consideration of diaphragm stiffness in the distribution of seismic forces, and a variety of recommendations relative to use of conventional construction. Bluebook provisions of the time focused on the design of complete shear wall and diaphragm load paths and an appropriate level of inspection during construction (SEAOC, 1990). While there was some attention paid to wood light-frame construction post-Loma Prieta, the collapses and near collapses in the Marina District were often dismissed as primarily driven by a soft soil/liquefaction issue. The dominant engineering issues of Loma Prieta included the collapse of sections of the Bay Bridge and the Cypress Structure in Oakland resulting in a reevaluation of the vulnerabilities of our transportation infrastructure. The 1994 Northridge Earthquake: While most of the structures badly damaged in Loma Prieta were built prior to “modern” codes, the dominant theme of Northridge was poor performance of some structures built in the era of “modern” codes, especially the brittle fracture of connections in the epitome of structural systems, the steel moment frame. But wood light-frame construction was also a significant part of the story of poor structure performance in The Northridge Earthquake. A number of lives were lost in collapses of wood light-frame structures, including 16 in the weak and soft-story Northridge Meadows apartment buildings and two in a collapsed hillside home. The very poor performance of weak and soft-story multi-family residential buildings was seen to occur not just in the older types of structures affected in the Loma Prieta earthquake, but also in much more recently constructed structures that represented a large portion of the housing stock (Figures 3 and 4), with more than 200 apartment buildings heavily damaged (EERI, 1996). In the Reseda area of the San Fernando Valley, entire neighborhoods were turned into ghost towns as many apartment buildings were red-tagged and could not be occupied. 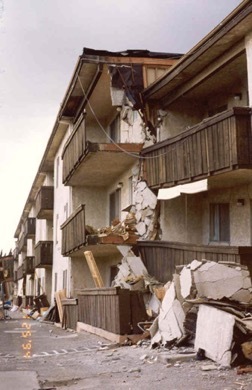 Some of these red-tagged buildings had weak/soft stories, but the greater engineering concern was widespread damage to more recently-constructed multi-family residential buildings with engineered shear wall systems that appeared to conform to recent building code provisions; these included splitting of foundation sill plates and wood tie-down posts and large drifts in buildings with multi-story stacked shear walls. This led to reexamination engineered design and detailing practice as well as refinement of test methods and structural hardware. Hillside homes were observed to be potential collapse hazards. The City of Los Angeles obtained photos to document several of the most severe collapses, but beyond this the City of Los Angeles Hillside Dwelling Subcommittee noted 117 significantly damaged hillside houses of the bearing/shear wall type and 40 of the stilt type, some of recent construction (EERI, 1996). Wide-spread, but less severe damage occurred to one- and two-family dwellings that, while providing good life-safety performance, required often times expensive repairs. Insured losses to wood light-frame structures were roughly seven times the $2 billion expectation based on ATC-13 (ATC, 1985) fragility functions for wood light-frame construction. The combination of the unexpectedly large insured losses and subsequent litigation caused significant strain in the insurance industry, resulting insurance companies withdrawing from the California residential insurance market. In response to this insurance crisis, legislation was adopted that led to the establishment of the California Earthquake Authority, as a not-for-profit, publicly managed, privately funded entity that ensured the continued availability of earthquake insurance to California homeowners. Shortly after the 1994 Northridge Earthquake: Several significant research projects were undertaken to provide guidance to the engineering and insurance industries. The CUREE-CalTech Woodframe Project was undertaken by the Consortium of Universities for Research in Earthquake Engineering (CUREE) in collaboration with the California Institute of Technology, with funding provided by the Federal Emergency Management Agency though a Hazard Grant Program award administered by the California Governor’s Office of Emergency Services. As described in the forward to its reports, this project set out “…to develop reliable and economical methods of improving woodframe building performance in earthquakes. To achieve that intent a wide range of issues was investigated, from detailed studies of economic losses to experiments studying the earthquake behavior of full-scale buildings. Multiple invitational workshops were also conducted to gather opinions and to guide subsequent efforts by the project’s researchers.” The Woodframe Project ultimately published 30 reports documenting wide ranging information, from extensive data bases characterizing damaged buildings, to physical testing, to analytical modeling, and loss estimation. Unique at the start of the project was the limited history of computer modeling to capture the likely earthquake response of Woodframe buildings. A significant effort was made to establish a basis for such modeling. A number of discussions and practical design and detailing recommendations were developed for use by practicing engineers, documented in CUREE publications W-30a and W-30b (CUREE, 2004). The entire set of CUREE Woodframe Project reports is currently available for free download from the Stanford University John. A. Blume Center web site. Assessment and Repair of Earthquake Damage in Woodframe Construction (The CUREE-CEA Project) was undertaken by CUREE with major funding from the California Earthquake Authority (CEA). As noted in the preface to its reports “The primary objective of the project is to bring sound science and engineering to the important but infrequent undertaking of earthquake damage assessment and repair of typical single- and multi-family Woodframe residential buildings in California.” This project produced a series of reports addressing both testing and guidelines. Of significant interest to the practicing engineer is the General Guidelines for the Assessment and Repair of Earthquake Damage in Residential Woodframe Buildings (CUREE Publication No. EDA-02) (CUREE, 2007). Similarly, the entire set of CUREE CEA Project reports is currently available for free download from the Stanford University John. A. Blume Center web site. Beyond these two major projects, research was undertaken by a wide variety of academic and industry organizations and individuals to better fill out understanding of earthquake behavior to the many and varied construction materials and components that make up light-frame construction. Testing and analytical modeling of wood light-frame structures that has contributed to verification and reconsideration of code design provisions for new structures, as well as many studies of likely performance and potential damage and loss. A variety of other resources are available for guidance on design of new Woodframe construction. Provisions have been developed for retrofit of dwelling cripple walls and their anchorage, including prescriptive pre-engineered retrofit provisions started after the Northridge Earthquake and now found in an International Existing Building Code (IEBC) appendix chapter (ICC, 2018), and related prescriptive plan sets developed regionally (Plan Set A in the San Francisco Bay Area, City of Los Angeles Plan Set, many other plan sets provided by local jurisdictions), and most recently expanded plan sets coming out of the South Napa Earthquake (FEMA DR-4193-RA2) (FEMA, 2015) and included in FEMA P-1100 (FEMA, 2018). Documents have been developed for overall assessment of wood light-frame dwellings for earthquake vulnerability (FEMA P-50, formerly ATC-50) (FEMA, 2012b) and for targeted assessment and retrofit of cripple wall, living-space-over-garage, hillside and chimney vulnerabilities in wood light-frame dwellings (FEMA P-1100, 2018). Current Status: At this point in time, woodframe structures are still believed to be one of the safest structure types to be in during an earthquake, but it is also know that there is a subset of woodframe structures within the existing building stock that are particularly vulnerable. Ordinances addressing evaluation and retrofit of weak/soft story woodframe buildings are being considered and adopted by a number of cities and counties in California. In particular, many jurisdictions in the Los Angeles area are following the lead of the City of Los Angeles in putting retrofit ordinances in place. In Northern California, Oakland is in the process of following the lead of San Francisco, Berkeley and Alameda, which have retrofit ordinances in place. It is hoped that ordinance adoption will continue to be taken up by additional jurisdictions. On the front of one- and two-family dwellings and retrofit of cripple walls, significant progress has been made, helped along by the prescriptive retrofit designs and plan sets, and by the California Earthquake Authority’s efforts to increase awareness of this vulnerability and through their Earthquake Brace + Bolt grant program that makes resources available to encourage the installation of cripple wall retrofits. ATC, 1980. The Home Builders Guide for Earthquake Design (ATC-4-1), Applied Technology Council, Redwood City, CA. ATC, 1985. Earthquake Damage Evaluation Data for California (ATC-13), Applied Technology Council, Redwood City, CA. CUREE, 2004. Recommendations for Earthquake Resistance in the Design and Construction of Woodframe Buildings, Parts I and II (CUREE W-30a, W-30b), Consortium of Universities for Research in Earthquake Engineering, Richmond, CA. CUREE, 2007. General Guidelines for the Assessment and Repair of Earthquake Damage in Residential Woodframe Buildings (EDA-02), Consortium of Universities for Research in Earthquake Engineering, Richmond, CA. EERI, 1990. Loma Prieta Earthquake, October 17, 1989, Preliminary Reconnaissance Report, Earthquake Engineering Research Institute, Oakland. CA. EERI, 1996. Northridge Earthquake Spectra, Northridge Earthquake Reconnaissance Report, Volume 2, Earthquake Engineering Research Institute, Oakland, CA. FEMA, 2012a. Seismic Evaluation and Retrofit of Multi-Unit Wood-Frame Buildings with Weak First Stories (FEMA P-807), Federal Emergency Management Agency, Washington, DC. FEMA, 2012b. Simplified Seismic Assessment of Detached, Single-Family, Wood-Frame Dwellings (FEMA P-50) Federal Emergency Management Agency, Washington, DC. FEMA, 2015. Earthquake Strengthening of Cripple Walls in Wood-Frame Dwellings (FEMA DR-4193-RA2), Federal Emergency Management Agency, Washington, DC. FEMA, 2018. Vulnerability-Based Seismic Assessment and Retrofit of One- and Two-Family Dwellings, (FEMA P-1100), Federal Emergency Management Agency, Washington, DC. ICBO, 1979. Uniform Building Code, 1979 Edition, International Conference of Building Officials, Whittier, CA. ICC, 2018. International Existing Building Code (IEBC), International Code Council, Country Club Hills, IL. SEAOC, 1990. Recommended Lateral Force Requirements and Commentary (SEAOC Bluebook), Seismology Committee of the Structural Engineers Association of California, Sacramento, CA. SEAOC, 1991. Reflections on the Loma Prieta Earthquake, October 17, 1989, Structural Engineers Association of California, Sacramento, CA. Figure 1. Weak and soft story behavior in the San Francisco Marina District. Photo Credit: Ron Gallagher. Figure 2. House with collapsed cripple walls. Photo Credit: Ron Gallagher. Figure 3. Northridge Meadows Apartment building with collapsed weak and soft story. Photo Credit: CUREE Caltech Woodframe Project. Figure 4. Northridge Meadows Apartment building with collapsed weak and soft story. Photo Credit: CUREE Caltech Woodframe Project.